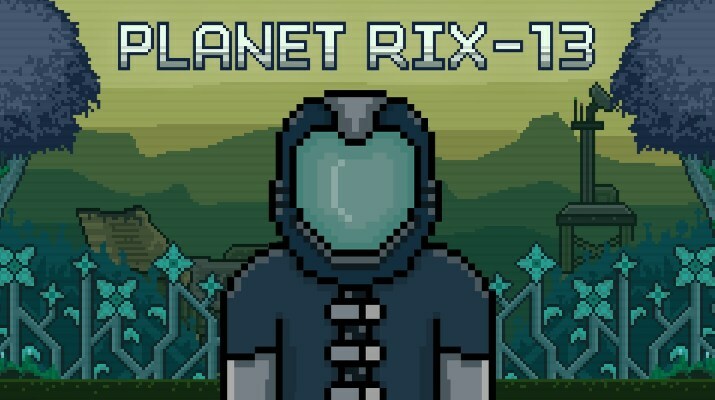 Planet RIX-13 is a 2D puzzle adventure title set in a distant world where you play the role of an explorer and scientist looking for a suitable place for humanity to call home. Unfortunately, your ship suffers a bad accident and our character is now fighting for his life. As the sole survivor of this mission, it’s up to you to finish the research on this planet and find a way to get home. One big problem is that the planet is covered in radiation and this makes surviving much more difficult. While exploring you’ll come across abandoned labs and radar stations looking for clues as to what happened to the old crew. Along the way, you’ll find notes and logs from people explaining their discoveries and the events that ultimately led to their demise. Hidden among the records are clues to the many puzzles that you’ll have to solve by either finding the right colored access card, the combination for a safe or even mixing some samples in order to create the perfect chemical reaction. The puzzles you come across are by no means easy to solve, but if you read every scrap of information that you come across you shouldn’t be stumped for too long. Controlling your character is simple, as you will only be moving on a 2D plan with the left analog stick and items or notes you come across are highlighted as you walk past them. You can pick up objects and put them into your inventory for use later with a single button press. There wasn’t really anything noteworthy about the puzzles themselves as they seemed too similar in execution and planning. I had no problems figuring them out without using a guide and adventure game enthusiast in particular, should have no problem breezing through the game. It seems that most of the effort was put into making this a creepy atmosphere to explore with the lack of music, although I believe a lo-fi synth soundtrack could have potentially helped the atmosphere. Typical to the genre you do have the previously mentioned inventory that you can manage and select items to use for certain puzzles. Each area in RIX-13 is small, so you don’t have to do too much exploring, however, there is too much backtracking which can make this already short title feel repetitive. With the lack of overall screen-time for you to explore RIX-13 comes across as somewhat of a cheapened experience, although it is only $4.99 on the eShop. Visually, I like how the art style has an old-school PC adventure game aesthetic that you would find on a floppy disk. the feeling of loneliness is conveyed well and while the graphics are simple, they are fitting for this solitary space adventure title. There are some really cool glitch screen effects that make the whole experience feel uneasy at times. My only complaints with the presentation is that your character really lacks any sort of personality and there is complete silence for most of the adventure. Overall Planet RIX-13 is a solid little puzzle adventure title that can be beaten in only a couple of hours and still deliver a satisfying experience. While it did tell a great story through a minimalistic presentation, I wish there was more of a reason to replay it as the two endings felt lackluster with their resolutions. I did like the pixel art-style and for $4.99 if you are a fan of adventure games, RIX-13 will most likely not leave you disappointed.